Here he is. Pap Pap. The man that needs everyone’s help. I know I keep posting about him and his need and Kate’s need for help. You may be tiring of it, but the goal hasn’t been met and I just can’t stop trying to get the word out. You know when you get one of those inside of you that you just know you MUST do? Well this is mine right now. I just have to. 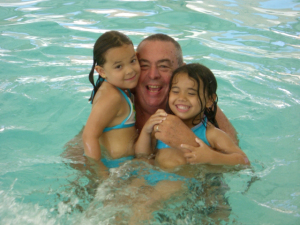 Kate gives you a story through pictures and why he is Pap Pap and so loved by his granddaughters. So Ronovan,from Ronovanwrites while I was at work made a great badge and posted it to help spread the word. How special that was to see it go through! But as I sat and ate lunch I thought, he is right -shhh don’t tell him I like to think I am always right 🙂 But here I am asking for you to help a complete stranger who means a lot to me but nothing to you and these two thoughts come to mind. 1. I am suddenly overwhelmed with the thought of all of you caring so much to help someone you do not know. 2. Shame on me for not letting you see who he is and what he means to the girls and I – after-all aren’t I a blogger?? ?